Well, the answer to Dan’s question got us more than we bargained for. It involves a story that spans centuries, and that same story not only explains Chicago’s enormous network of alleys but also why some parts of the region are conspicuously alley-free. What gives? Why all the alleys — and why the divide between Chicago communities with and without them? This expanding grid eventually hit the Chicago area. 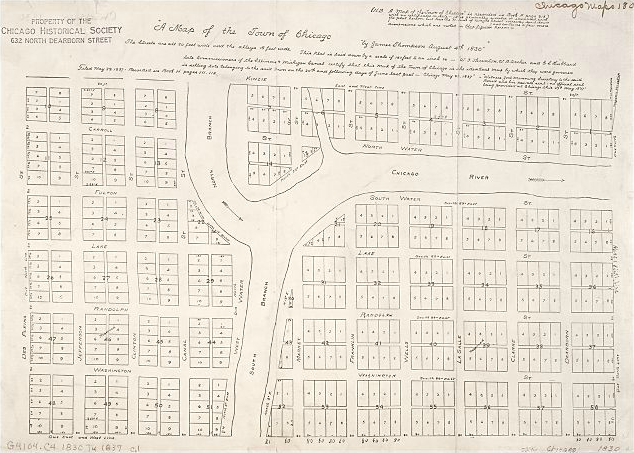 Thompson was apparently a law-abiding man: His town plan for Chicago had 58 blocks, and every single one had an alley. As it turns out, it’s a good thing that Thompson planned Chicago with alleys. The city was a filthy, stinky, disease-ridden place in those days. Rear service lanes were essential for collecting trash, delivering coal, and stowing human waste — basically, keeping anything unpleasant away from living quarters. Constance Guardi, from the Riverside Historical Commission, takes me on a walking tour of the town. As we stroll down winding, tree-lined streets, she points to old, beautiful houses set back behind lush, rolling lawns. Guardi explains that Olmsted wanted to create the town of the future: a community that combined the peacefulness of the country with the luxury of the city. She says Olmsted’s master plan for Riverside didn’t include alleys, because they just weren’t necessary in the wide open spaces of the Illinois countryside. It so happens that Guardi is exactly the kind of person Olmsted had in mind when he planned Riverside. She grew up in a Chicago neighborhood with alleys, and she never cared for them. For years after it was established, Riverside was an outlier. Other suburbs that popped up around it in the years to come — like Berwyn and Cicero — followed Chicago’s lead with alleys and a grid. Look at a map of the area today, and Riverside is a squiggly green island in a sea of squares. By the turn of the century, though, more city planners jumped on Olmsted’s bandwagon and began designing communities to be beautiful and clean — counterpoints to the density and industry they wanted to avoid. As a sign of the times, a 1913 development competition in the suburbs of Chicago yielded almost no designs with alleys; instead, the proposals featured curvilinear streets, and blocks with interior courtyards. (The account is contained in a book authored by alleys scholar Grady Clay.) In one proposal for the contest, Frank Lloyd Wright advocated for the abolition of alleys. Martin says the death of the alley came about from this shift in urban planning principles, but other factors contributed, too, including improvements in sanitation technology. Then, the automobile came along. In 1920 there were about 8 million car owners in the country; by the end of the decade that number jumped to 23 million. Widespread auto ownership meant there were fewer stables and less horse poop in the city. More importantly, the automobile increased the mobility of working Americans, allowing people to live way out in the sparse suburbs, where the house lots were spacious and streets didn’t have to conform to a dense city grid. 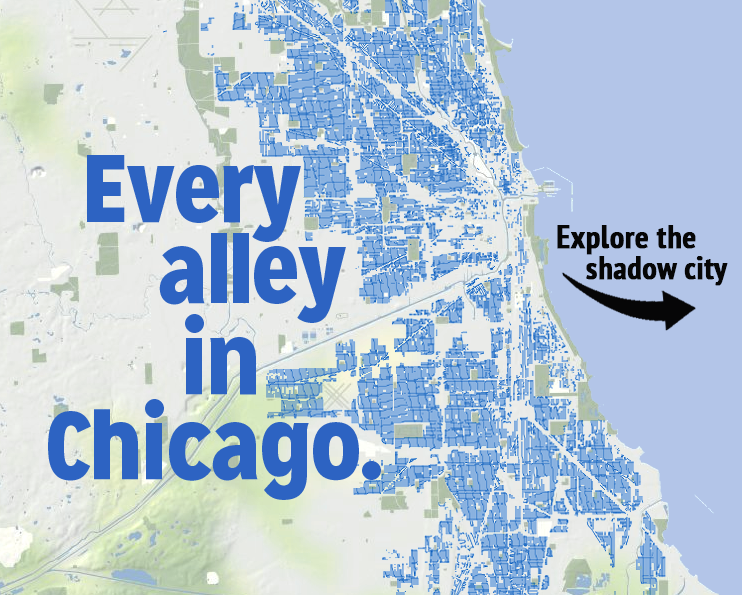 The move away from alleys in the early 20th century — combined with the end of Chicago’s growth via annexation — solidified the divide between alley places and non-alley places in the Chicago region. While new suburban towns and outlying communities forged bravely into an alley-free world, Chicago’s historic core and the older suburbs were stuck with their alleys. You can see the effects today. 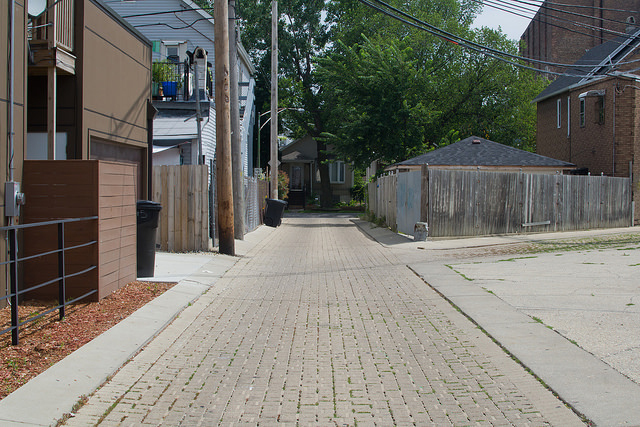 Within the Chicago city limits, 90 percent of residential blocks have alleys. But as you move from the city center, alleys begin to fall away. Not immediately, mind you. 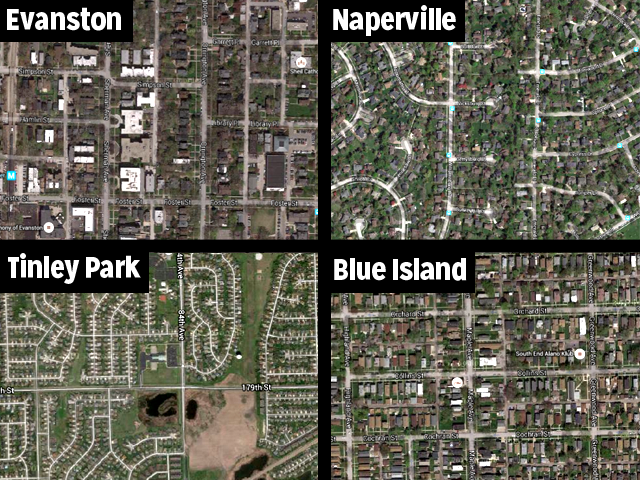 Suburbs like Oak Park, Evanston, and Blue Island are chock-full of alleys, but in suburban communities like Naperville and Tinley Park, alleys are much harder to find. The role of Chicago’s alleys has obviously changed; even though the city doesn’t need alleys for the same reasons it did back in the 1800s, they’re still essential parts of the city environment. Today, residents put recycling back there instead of piles of horse dung. And, utilities deliver phone service and electrical power through alleys rather than coal. Plus, after centuries of building up around them, alleys are pretty hard to get rid of. A few American cities have instituted “alley vacation” programs. They’re not so fun as they sound: The programs basically involve vacating the alley as a public service lane. For the program to work, however, every alley-abutting homeowner has to agree to extend their property line into the middle of the alley. Not many cities have followed through with the administrative nightmare. Instead of eliminating them, Chicago is reimagining its alleys. In 2006, Chicago became one of the first cities in the country to conduct a “green alley” program, resurfacing alleys to prevent runoff and decrease solar heat absorption. In the last several years, the Chicago Loop Association has been experimenting with alleys as social spaces, using them to host pop-up art events. Martin says Chicago’s current approach holds promise for the future, and many contemporary urban planners and architects agree. The New Urbanist school of thought considers them to be both useful infrastructure and an important part of the cultural landscape. “My curiosity about the alleys came about because it&apos;s part of the landscape and it&apos;s one of these things that you don&apos;t really think about,” says Dan Weese. “It&apos;s in the background, but it actually forms a really important part [of the city]." As for any takeaways from our reporting? He says it’s especially interesting that the alley hasn’t become entirely irrelevant. “There was this structure that apparently came about because the folks in the canal commission thought it was a good idea to put in alleys, and then human behavior adapts to that and morphs it,” he says. Architecture happens to run in Dan’s veins. His uncle is none other than renowned architect Harry Weese. (Curious City profiled one of Harry Weese’s buildings, the Seventeenth Church of Christ, Scientist.) Most of Dan’s cousins are architects or designers and his parents founded an award-winning architecture firm — a firm that he now works for. When he was a kid, Dan played kick-the-can and raced go-carts in the alley behind his house. He also broke a lot of stuff back there. Now 50 years old, Dan lives with his wife and three children, just three blocks from the rowhouse he grew up in. Unfortunately the couple lives in a highrise, and the alley isn’t nearly as good for playing as the one he remembers. That is, Dan’s all grown up, and he prefers nerding out about alleys and their history, rather than destroying things in them. Want to make your own alley map? Click here to download the data. 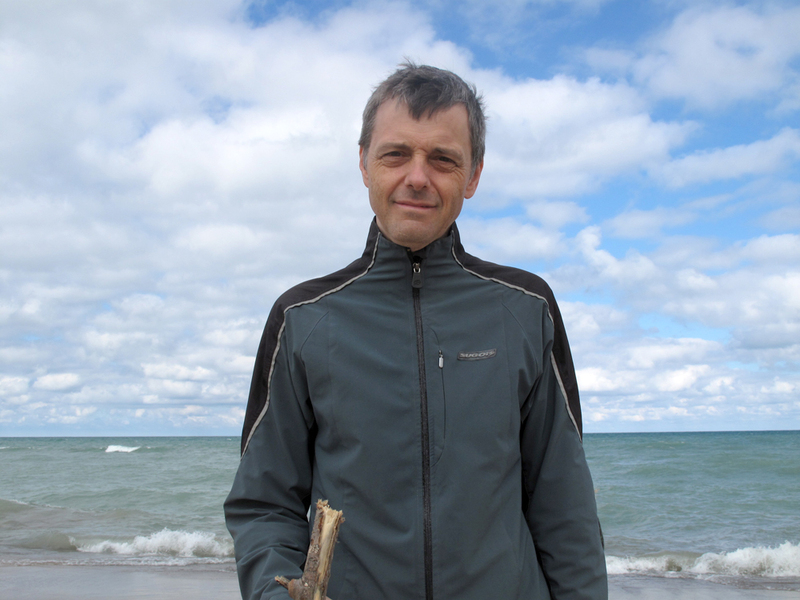 Steven Jackson is an independent producer living in Chicago. Follow him on Twitter @_sbjackson.